Image caption The government may have undervalued Royal Mail shares to the tune of £1bn, the committee said. 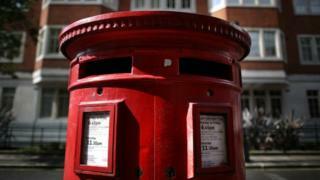 Taxpayers may have lost out on about £1bn from the undervaluing of Royal Mail, a committee of MPs has said. The government feared failure and acted on bad advice over the Royal Mail stock market flotation, reports the Business, Innovation and Skills select committee. The Department for Business said the MPs' report contained "factual errors and misunderstandings". Royal Mail shares were priced at 330p, but jumped as high as 618p per share, and now stand at around 473p. Business Secretary Vince Cable told the BBC: "They now have the benefit of hindsight, which we didn't have at the time. We sold at a price that was regarded as the best that could be achieved in the context in which we sold it." He added: "The point we have stressed, and I've stressed over and again, that the price of shares is very, very volatile - these things go up and down and we've seen in the last few weeks the price of Royal Mail shares actually falling like a stone." His department pointed out that taxpayers had made £2bn from the deal. But in its scathing report the select committee said the shares had been undervalued and property owned by the Royal Mail had been mispriced when 60% of the company was floated in October. A further 10% of shares were given to Royal Mail employees. "We believe that fear of failure and poor quality advice led to a significant underestimate of the demand for Royal Mail shares," said Labour MP and committee chair Adrian Bailey. Speaking to the BBC, Mr Bailey said: "I do think if any minister loses that sum of money to the public purse then they really should reconsider their position." External adviser Lazard, plus co-ordinators UBS and Goldman Sachs oversaw the flotation. "Ultimately the blame must lie with the government. The buck stops with government," said Mr Bailey. "But it's quite clear they were very badly advised." In its defence, the Department for Business said: "The committee's views on the share price are based entirely on hindsight and ignore that we were selling 600 million shares. "They found no evidence that the department or its advisers missed vital information prior to sale." The committee also said it was "disturbed" that the taxpayer may not have benefited from valuable assets included in the privatisation. In particular it highlighted three sites in London which the National Audit Office (NAO) said had a hidden value of up to £830m. Media captionGeorge Osborne: "The sale of Royal Mail secured its future as a company"
According to the select committee, the NAO recommended that those assets should not be included in the privatisation or an arrangement should be made to claw back proceeds of any future sale of those properties. "The government's inclusion of Royal Mail's 'surplus' assets in the sell-off, without the prospect of clawing back future proceeds, may also mean the taxpayer losing out once again," Mr Bailey said. The committee also expressed concern about so-called preferred investors who received large blocks of shares, prior to the flotation. Some were also advisers to the government over the share sale. Lazard, UBS and Goldman Sachs all had Royal Mail shares allocated to separate parts of their businesses. Lazard and the banks made millions of pounds on the sale on behalf of clients. "It's very important that when the government does sell off a government asset, it does so through a process that quite clearly demonstrates that nobody selling it, nobody advising it, has a conflict of interest," said Mr Bailey. Lazard & Co was paid £1.5m for advising the government. Lazard Asset Management (LAM), which was selected as one of the preferred bidders, made £8.4m for clients by selling shares shortly after the flotation. LAM itself made a profit of around £40,000 from the share sale. However the Department for Business said: "There is no evidence that the government's independent adviser, Lazard, or any other bank involved in the sale, breached the Chinese walls that existed between different and unrelated parts of the business." Media captionShadow Business Secretary Umunna: "What we saw here was a first-class short-changing of the taxpayer"
Labour shadow business secretary Chuka Umunna said: "The business department did not attach appropriate value to Royal Mail when they were selling it and what this has resulted in is a first-class short-changing of the taxpayer to the tune of hundreds of millions of pounds. "This is staggering incompetence on a grand scale by ministers." BBC business editor Kamal Ahmed said: "If we go back to the run-in to the sale, this whole process was stalked by a fear of failure. "The advisory banks have been criticised in the Business Select Committee report, but they were constantly urged to be cautious. "There's only one thing worse I think for the government than the price going up as fast as it did and that would be if the price went down. That was the one thing that could not happen." On Wednesday, the government announced there would be a review, led by former City minister Lord Myners, of how it handled stock market flotations. The committee's report is the latest in a series of official criticisms of the sale, including by the National Audit Office and the Public Accounts Committee.